With the shift of emphasis from the West to emerging economies such as China, Brazil and India, organisations need to restructure to adapt to the new global economy. Teams and projects are increasingly being scattered all over the world, and a manager operating in this environment can't connect face to face with people in their team. Not only will managers need to adapt to develop their skills for new environments, they will have to work better, quicker and faster. 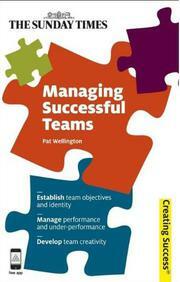 Managing Successful Teams prepares you to meet the challenges of building and leading teams, showing you how to improve performance and achieve the best results. Offering valuable advice and instant strategies, it covers each aspect of managing teams in new cultural shifts, including developing team creativity and innovation, realigning the teams identity with your leadership style and effective team leadership. The only book on the market to incorporate emerging trends and shifts in business practice, Managing Successful Teams addresses the practical and realistic issues you face in your everyday working life.